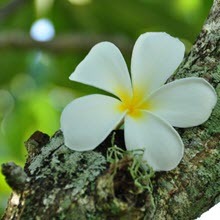 This is the 2nd part of 2-part blog series. Part 1 can be found HERE. 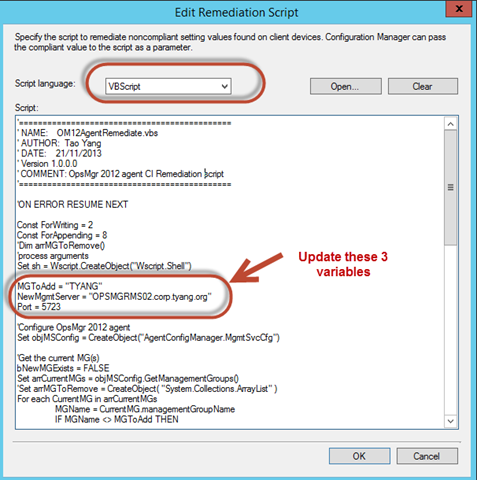 In Part 1, I went through the issues I had with deploying OpsMgr 2012 R2 agent via ConfigMgr 2007. 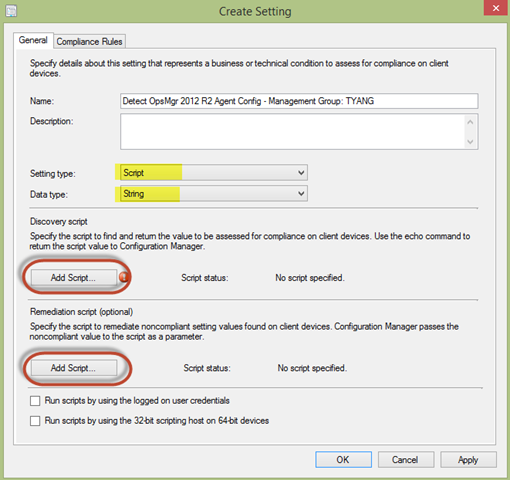 In this article, I will go through the steps I took to deploy OpsMgr 2012 R2 agent using ConfigMgr 2012 Application model and Compliance settings (DCM). 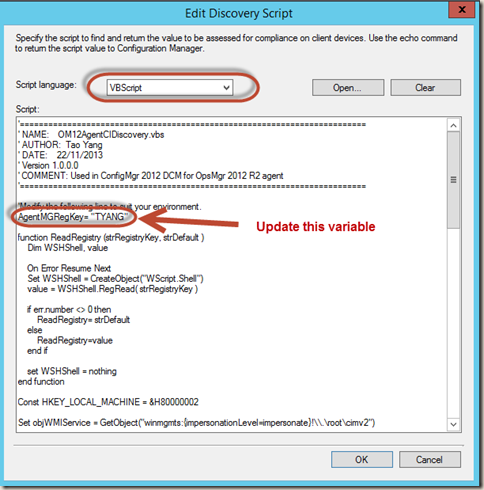 Moving to ConfigMgr 2012, I have decided to do utilise the new application model (it’s also to align the policy we set during the design phase of the System Center upgrade project: that wherever is possible, the new application model should be used rather than using the traditional packages / programs in ConfigMgr). 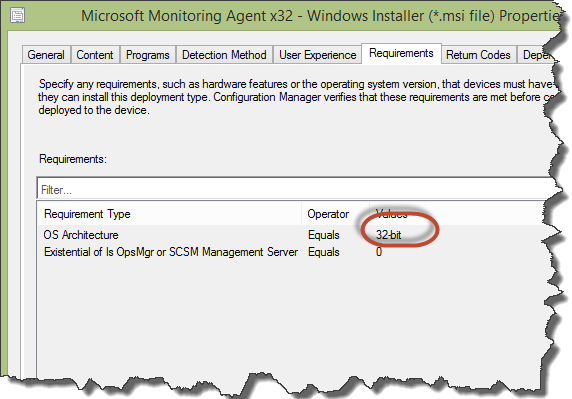 By packaging the OpsMgr 2012 R2 agent as an application in ConfigMgr, it is enforced on the ConfigMgr client (i.e. 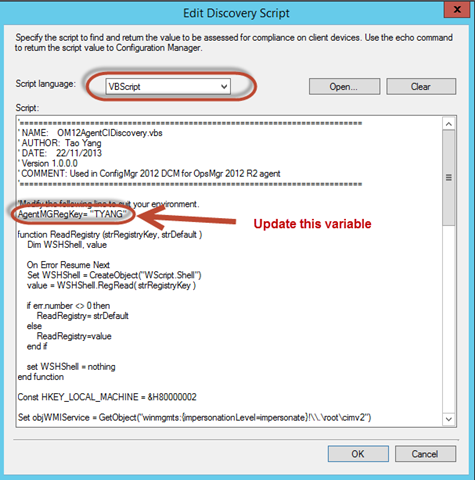 ConfigMgr will automatically install it again if someone manually uninstalled it). Instead of creating multiple programs within one package for different management groups, I could create different deployment types for different OpsMgr MG’s within the same application. 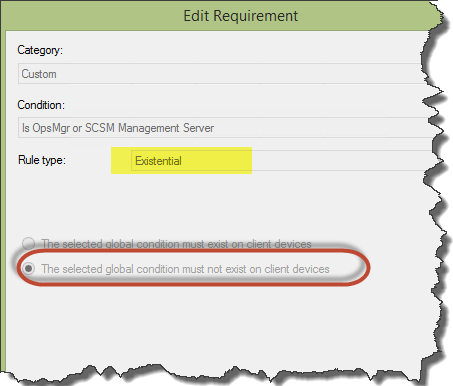 But, because ConfigMgr client will evaluate ALL deployment types in the order I configure using global conditions, it is just going to be way too complex for me to setup global conditions for such a complex OpsMgr environment. Further more, sometimes there are ad-hoc requirements that we also have to move OpsMgr clients among different MG’s for testing and troubleshooting. By using global conditions, this is almost unachievable in my scenario. 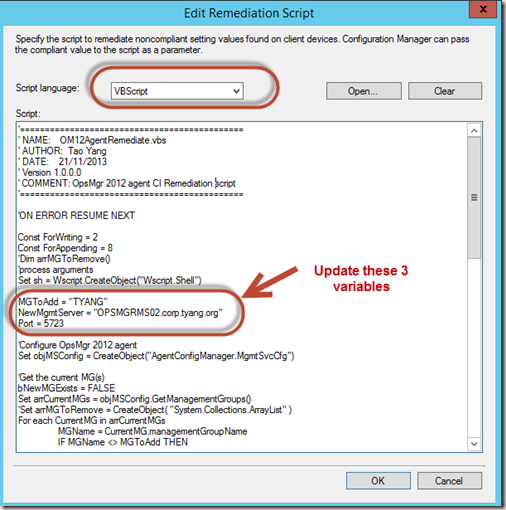 One way to avoid totally relying on global conditions for the OpsMgr agent application is to create multiple OpsMgr 2012 R2 Agent applications within ConfigMgr 2012 R2, one for each OpsMgr 2012 R2 management group. This is an admin overhead – having to manage and maintain 4 (in my case) almost identical applications for the same purpose. 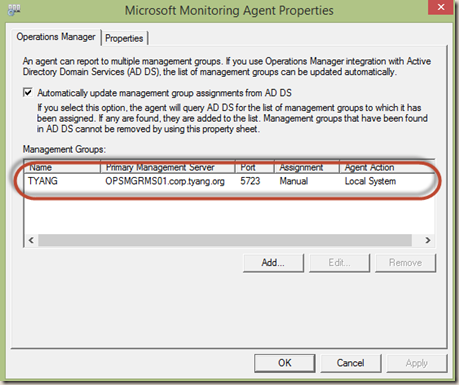 Configure OpsMgr 2012 R2 Agent to point to the appropriate management group. 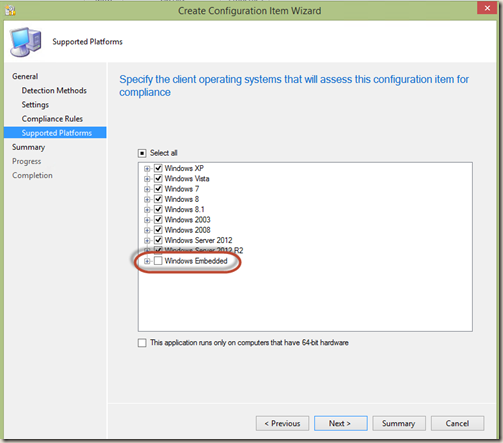 By having Compliance Settings in the picture, the application in ConfigMgr will take care of step 1 – installing the agent. 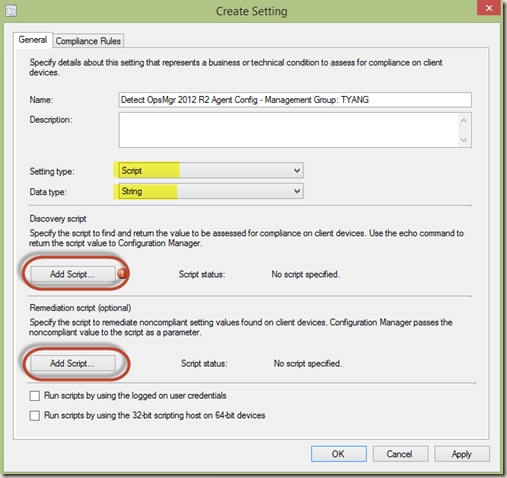 And then I create a Compliance Settings Configuration Baseline to ensure the OpsMgr agents are reporting the the correct management group. 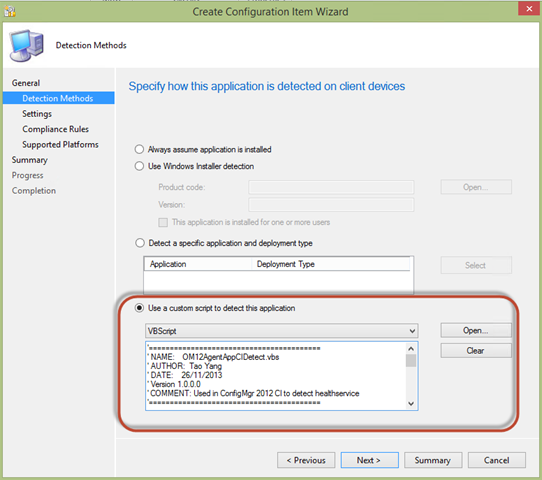 One good thing about ConfigMgr 2012 is that both applications and configuration baselines are enforced (Configuration Baseline can be configured to auto remediate in 2012, which is not possible in ConfigMgr 2007). Note: I’m only using this approach because we are managing multiple OpsMgr management groups, if there is only one management group in your environment, this is probably unnecessary and over-complicated. 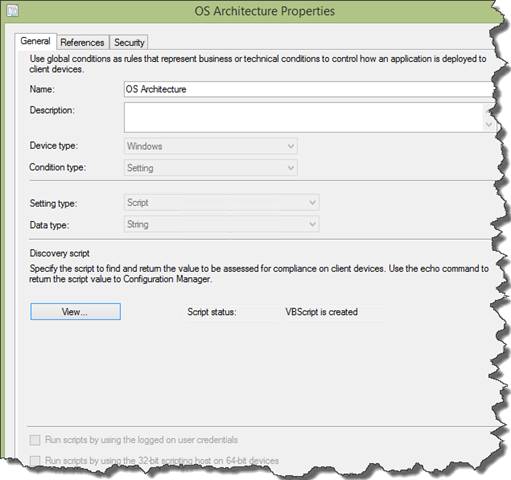 As the name suggests, the “OS Architecture” Global condition detects the OS architecture using a VBScript which I wrote a long time ago and kept reusing it in many places. 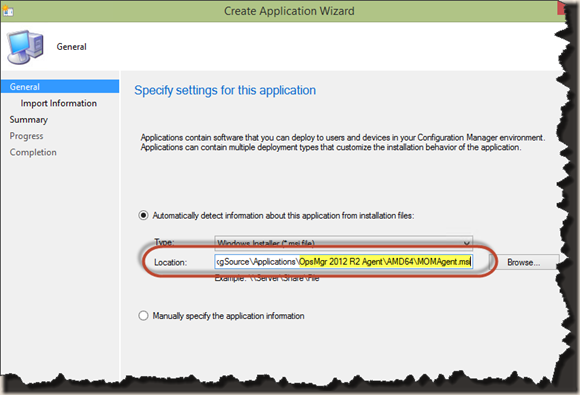 Next step is to create the application for OpsMgr 2012 R2 Agent. 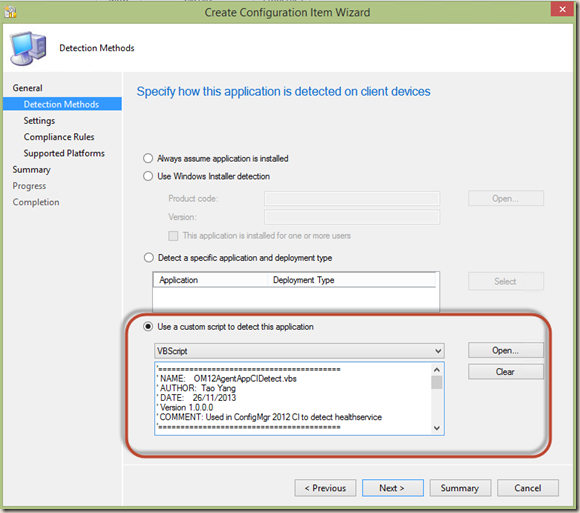 the “Create Application Wizard” is very straight forward. 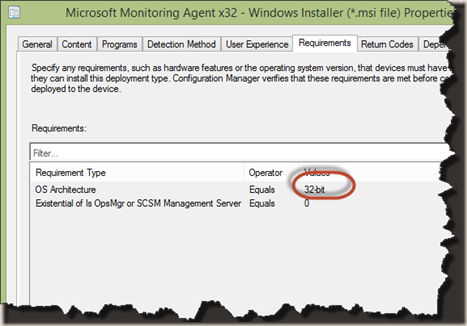 simply select either the 64-bit or 32-bit MOMAGENT.MSI and the wizard will identify all required information from the MSI. 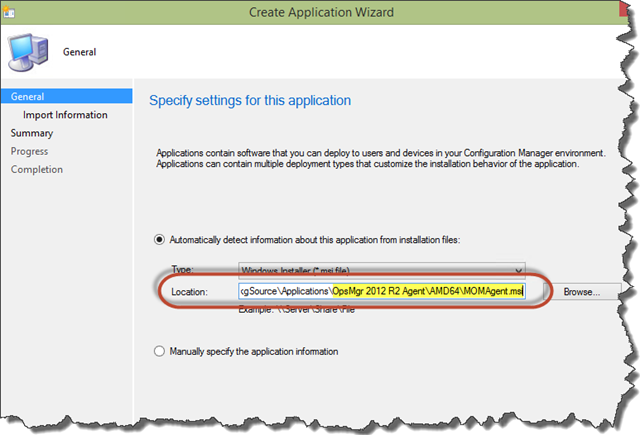 I have changed the name of the application from “Microsoft Monitoring Agent” to “OpsMgr 2012 R2 agent” as I don’t expect every ConfigMgr operators in my company knows that Microsoft has renamed the OpsMgr agent in the 2012 R2 release. 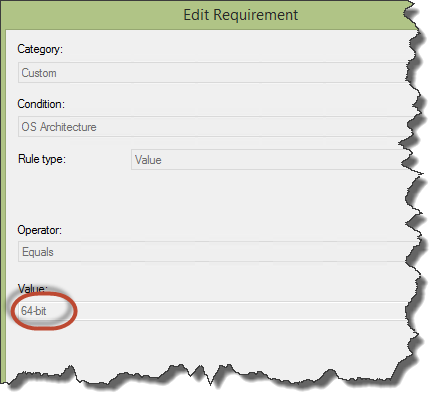 AcceptEndUserLicenseAgreement=1 is a required parameter. Without it, the MOMAgent.MSI will not install in quiet mode. 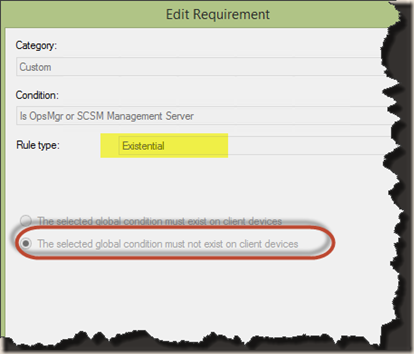 Now I need to use the two global conditions I created earlier to define requirements for each deployment type. 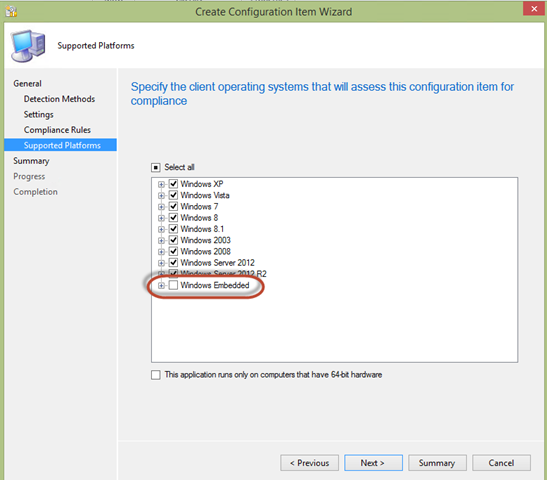 Note: If a server is in the process to be setup as OpsMgr or Service Manager management server (or Service Manager DW management server), and it is already managed by ConfigMgr, please make sure it is not a member of the collection which the OpsMgr 2012 R2 Agent is deploying to, otherwise OpsMgr 2012 R2 agent might be install prior to the installation of OpsMgr or Service Manager server components and it will cause the server components installation to fail. 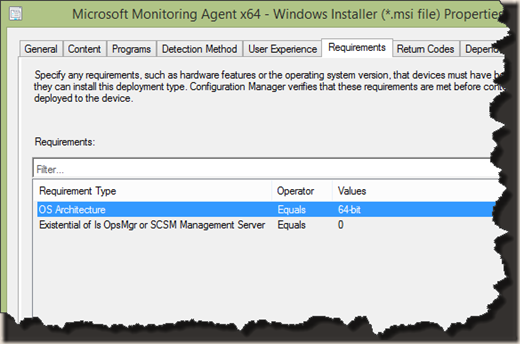 When installing OpsMgr management server, OpsMgr agent MUST NOT be present on the computer. 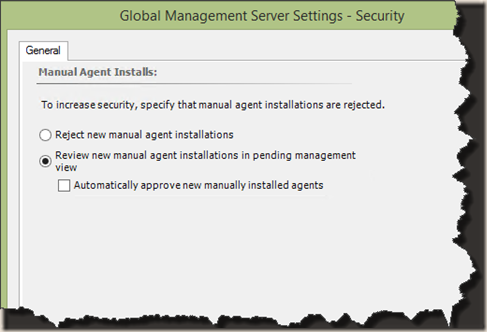 When installing Service Manager management server or Data Warehouse management server, OpsMgr agent MUST NOT be present on the computer. 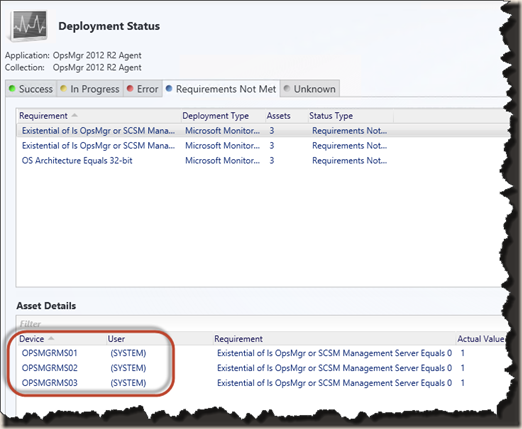 When installing Service Manager web portal server and it will later on be monitored by OpsMgr, the OpsMgr agent MUST be installed prior to the installation of Service Manager web portal. 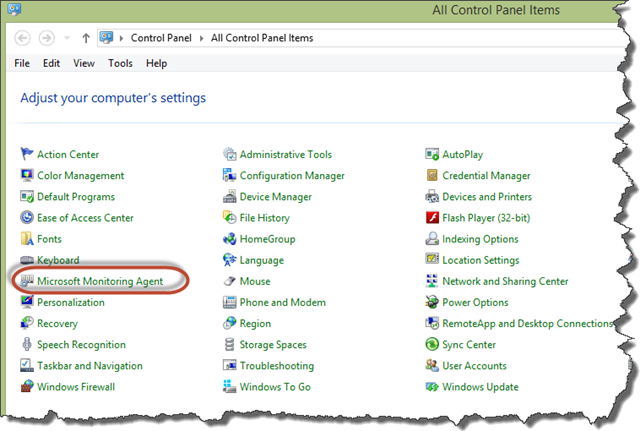 Otherwise, OpsMgr agent cannot be installed after the Service Manager web portal is installed. 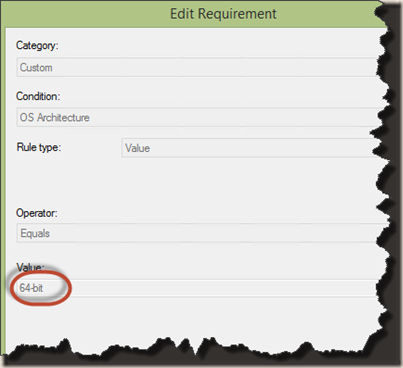 Now that the application creation is complete, time to setup Configuration Baseline(s). 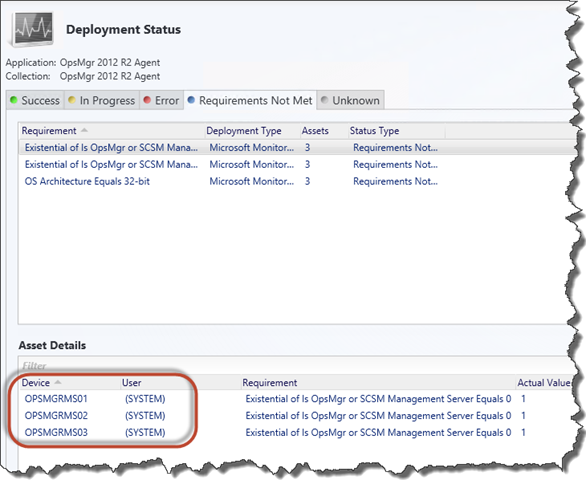 I will need to setup one configuration item and one configuration baseline for each of the OpsMgr management groups. 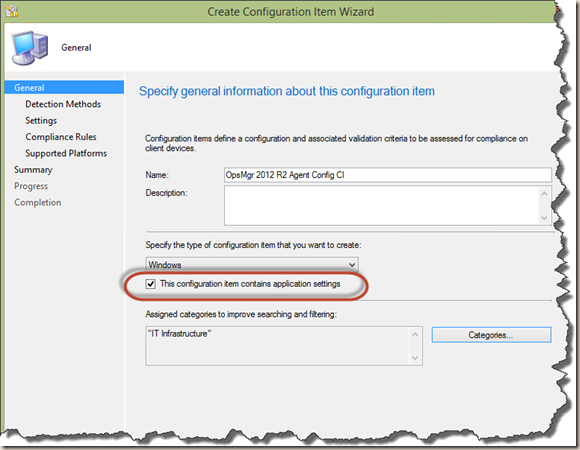 For the demonstration in this blog post, I’ll only setup one set of configuration item and configuration baseline – for the OpsMgr 2012 R2 management group in my lab. 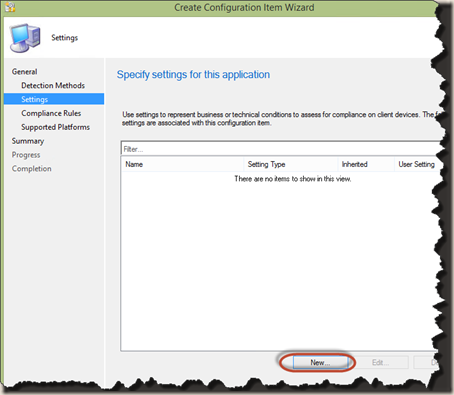 Firstly, the Configuration Item needs to be created. I named in “OpsMgr 2012 R2 Agent Config CI” in my lab. But in real life, I’ll include the OpsMgr management group name in the Config Item name because is unique to that particular management group. 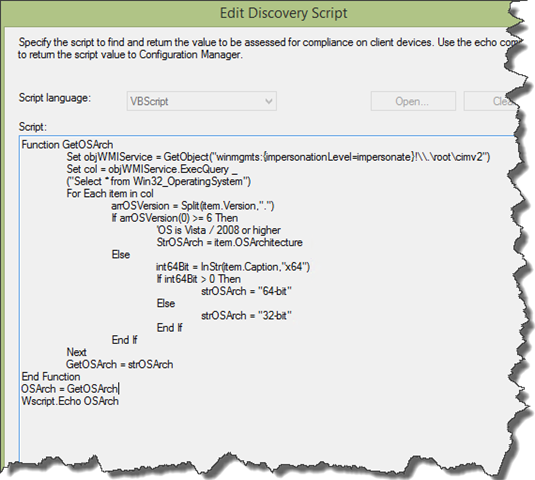 Next, for the application detection method, I use a VBScript to detect if the healthservice service is present. 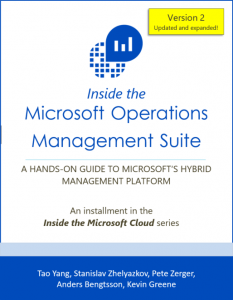 Note: I understand healthservice is also present in OpsMgr and Service Manager management servers. 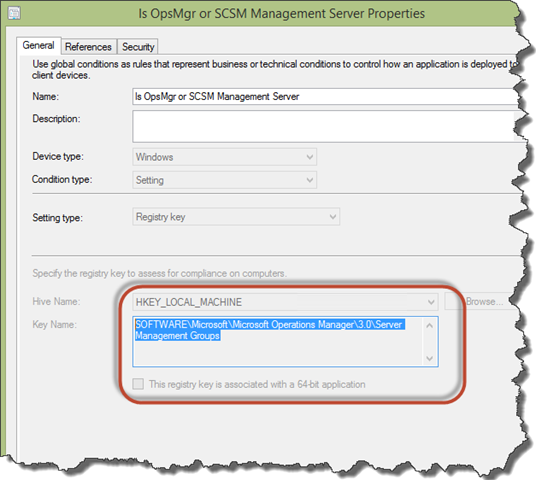 Because the application deployment can be targeting a collection containing OpsMgr or Service Manager management servers, I need to make sure the CI detects the management servers as well, just in case the same collection is used for the Configuration Baselines. 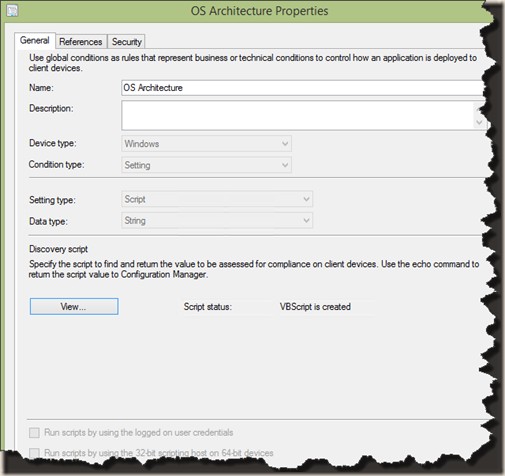 If I don’t include management servers in the CI application detect script (i.e. 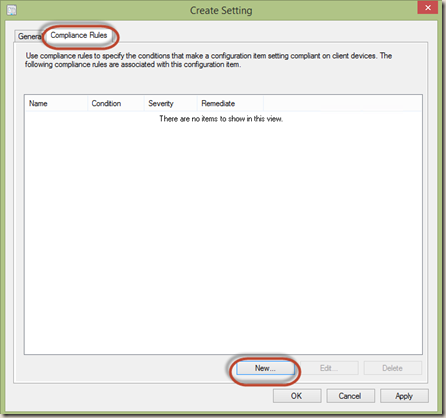 by directly detecting the OpsMgr agent), the Configuration Baseline evaluation result will be Non-Compliant on a management server, which is not a desired result. The script I used in later stage has the smarts to identify management servers. 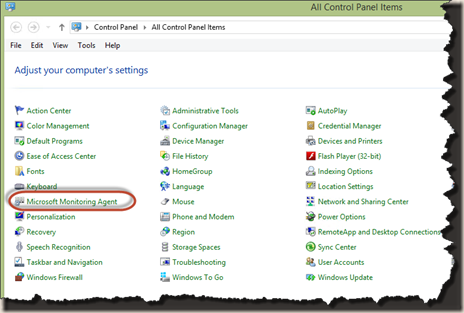 In the General tab, give setting a name, remember this is unique to the specific OpsMgr management group. Both scripts are written using VBScript. ‘Modify the following line to suit your environment. ‘Health Service found. 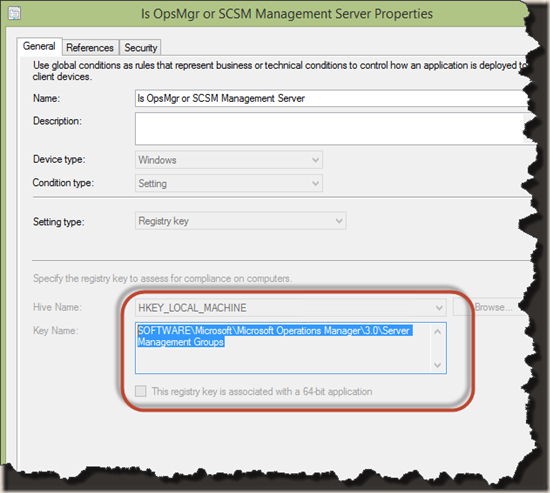 Check if this machine is an OpsMgr or Service Manager management server. strKeyPath = "SOFTWARE\Microsoft\Microsoft Operations Manager\3.0"
‘Wscript.Echo "OpsMgr or SCSM management server detected." 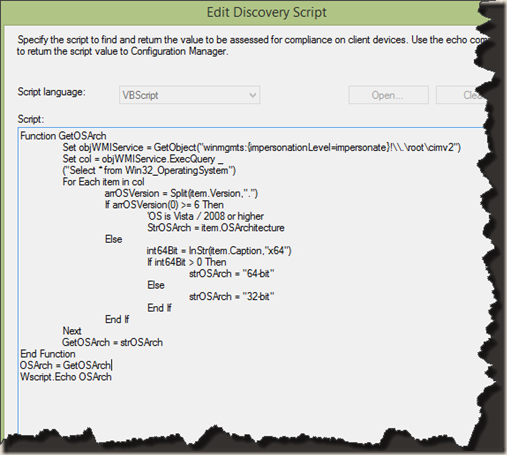 ‘Wscript.Echo "Check Agent’s MG config"
strKeyPath = "SOFTWARE\Microsoft\Microsoft Operations Manager\3.0\Agent Management Groups"
Please note in the beginning of the script, the variable “AgentMGRegKey” needs to be modified in each environment, it should be the name of the OpsMgr management group. MGToAdd = "<Your Management Group Name>"
NewMgmtServer = "<Your Management Server’s FQDN>"
The Selected Setting should be default to the setting just created. 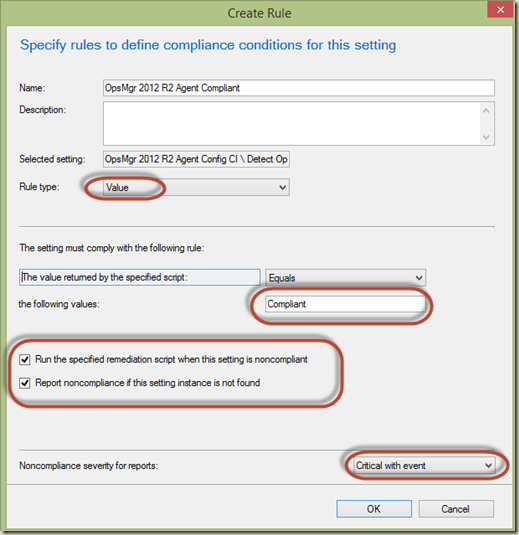 Tick the “Report noncompliance if this setting instance is not found” check box. 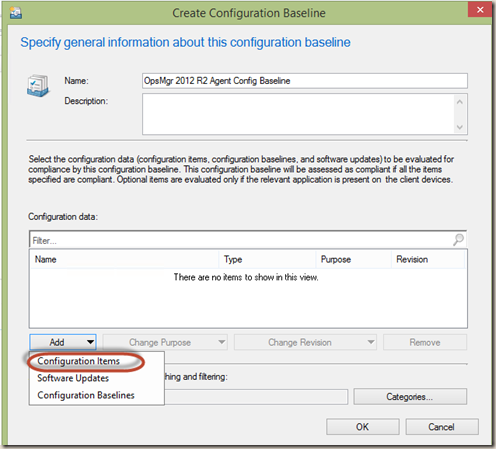 Now that the Configuration Item is created, I need to create a Configuration Baseline. Again, in real life, I’d name the Configuration Baseline something relevant to the OpsMgr management group it represents. 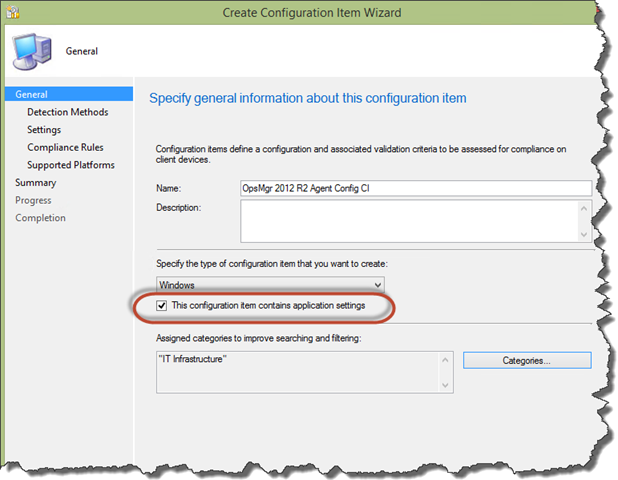 The creation of the Configuration Baseline is pretty straightforward, I need to add the CI I’ve just created to it. Now, the Configuration Baseline is created, I’ll create a collection that contains all the OpsMgr 2012 R2 agents that SHOULD report to this particular management group, and then deploy the baseline to this collection. 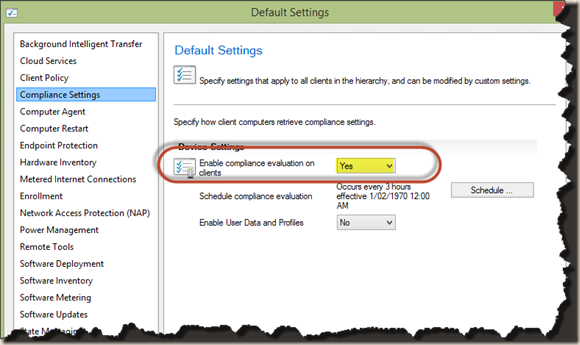 When deploying the baseline, make sure the “Remediate noncompliant rules when supported” check box is selected. Note: In real world, I would create a collection for the OpsMgr agent application deployment, and then create separate collections for each management groups for the Configuration Baslines deployments. 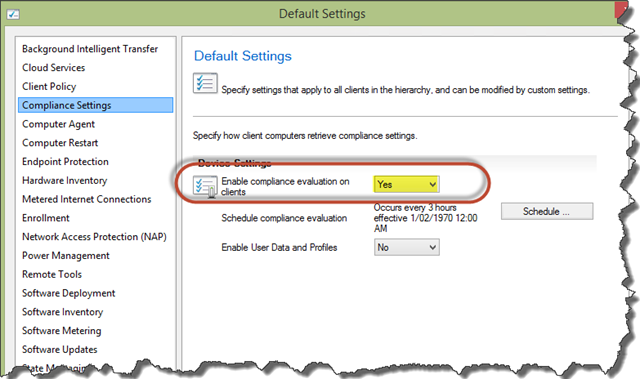 If you want to test the Configuration Baseline, you can simply delete the management group from the Microsoft Monitoring Agent, and then click the “Evaluate” button in ConfigMgr client under “Configuration Tab”. 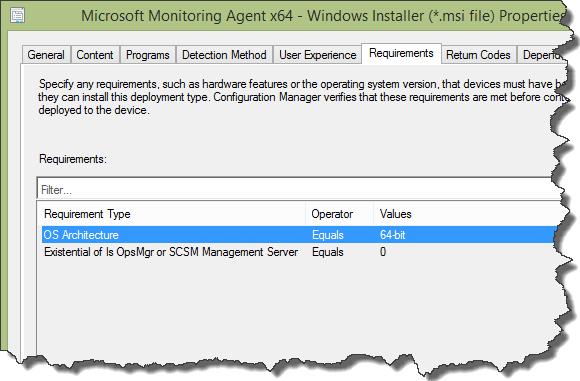 If everything is working as expected, the configuration baseline will show as compliant and the management group is added back to the Microsoft Monitoring Agent. 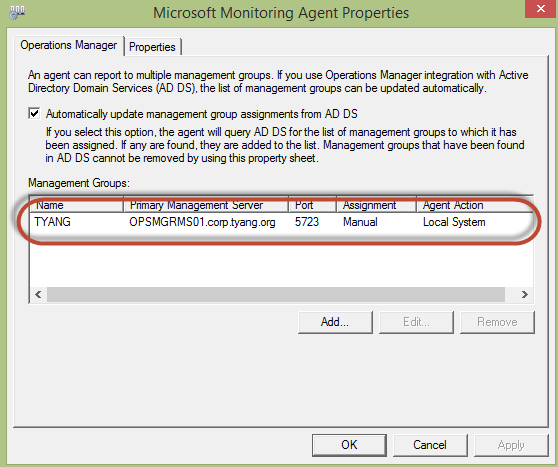 Note: In the scenarios I mentioned earlier that sometimes when we need to temporarily move OpsMgr agents to different management groups, we will need to modify the collections which the Configuration Baselines are targeting to. 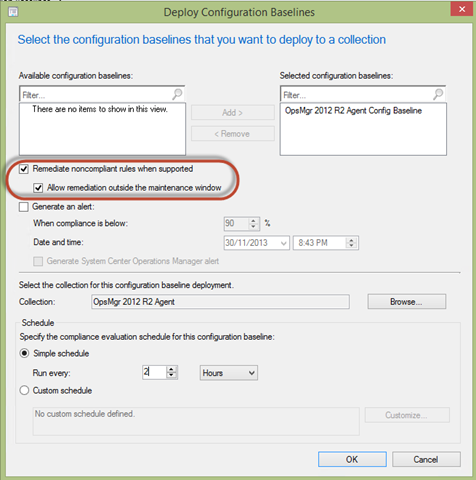 To do so, I can firstly create a temp collection to include all OpsMgr agents that I need to move, then exclude this collection from the original Configuration Baseline collection and include it in the Configuration Baseline collection for the target management group. This is so much easier and flexible and we don’t even have to manually move the OpsMgr agents as the Configuration Baseline is going to move them for us. 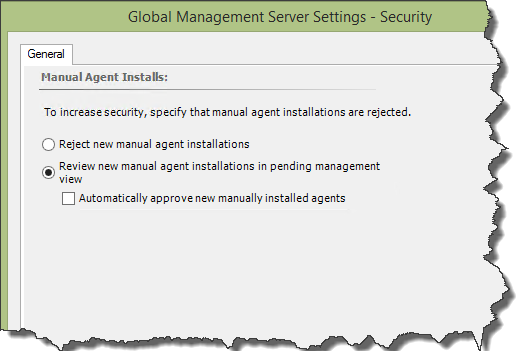 If the management group is configured to reject new manual agent installations, you will never see any newly installed & configured OpsMgr agents in the OpsMgr console. 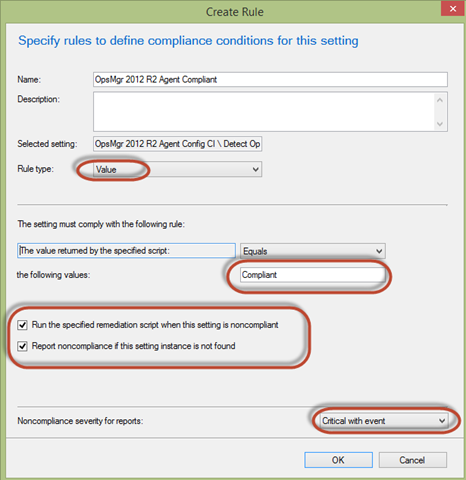 You need set it to either automatically approve or review manually installed agents. 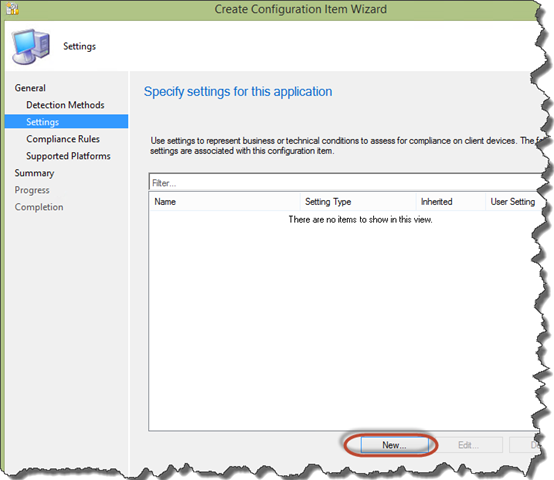 By using this method, in an environment with multiple OpsMgr 2012 R2 management group, we can avoid creating multiple applications for OpsMgr 2012 R2 Agent (for different management group) and avoid creating potentially complicated global conditions for the application deployment. 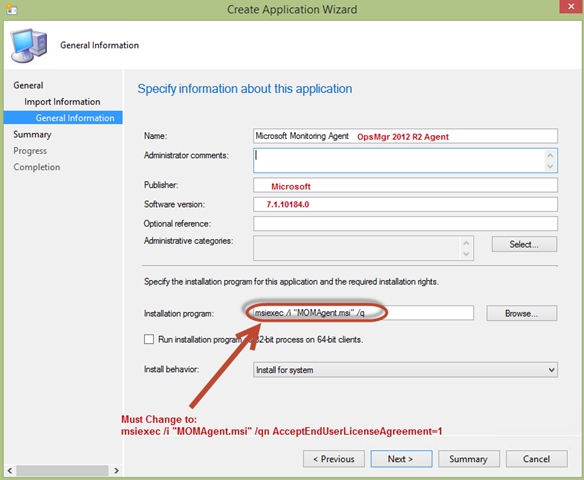 This method also ensures both the OpsMgr 2012 R2 agent installation and configuration is enforced. 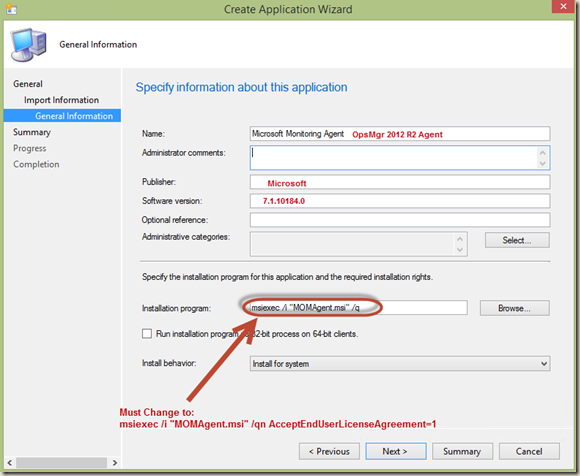 This prevents anyone with admin access on the endpoint to uninstall OpsMgr 2012 R2 agent or modify it’s configurations. Hi Tao, i like your aproache but you forgot one thing? maybe it is not needed in your envirorement?! Love the guide Tao! Thank you so much for taking the time to document this. 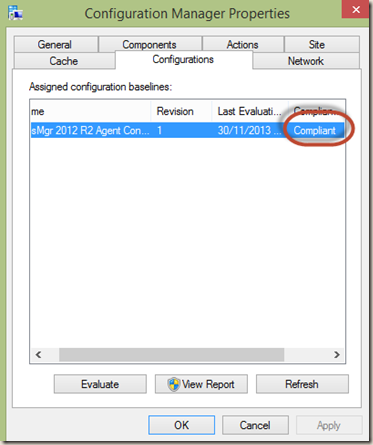 It saved me a bucket load of time in deploying SCOM 2012 R2 agents across our environment. 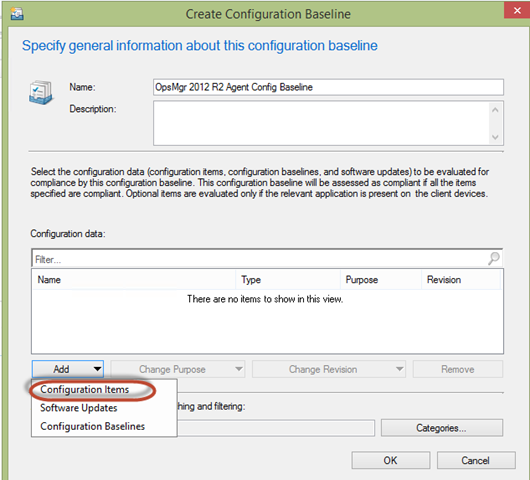 This will start the SCOM service once the config has been applied. If this isn’t done, one has to either logon the server and start it manually, or reboot the server to get it started. This is due to it failing to start as it is lacking any configuration to work with when it is installed. Hope this might be helpful to you and others!